Watch Movies and Ace the SAT, ACT, GED and GRE! Do you need to brush up on your vocabulary skills for the SAT, ACT, GED, or GRE exam? Ever wish you could put your talent for quoting your favorite movies to more use than one-upping your friends? Now you can do both with Name That Movie! A Painless Vocabulary Builder: Romantic Comedy & Drama Edition. Name That Movie! 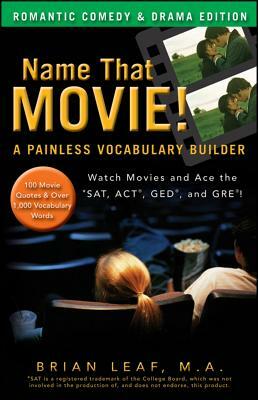 is the only vocabulary workbook that capitalizes on your insatiable appetite for romantic comedies and dramas to help build your vocabulary for standardized tests. First, you'll be presented with a popular quote. Then you'll identify the movie and scene from which it was taken. Next, you'll jot down possible definitions for each bolded word in the quote and check your answers against the solutions provided. It's that easy! Whether you're the queen of quoting Mean Girls or just want to find a more exciting way to build your vocabulary skills, Name That Movie! A Painless Vocabulary Builder: Romantic Comedy & Drama Edition is for you! BRIAN LEAF, M.A., is the owner and Director of New Leaf Learning Center. In his eighteen years of private teaching and tutoring, Brian has provided SAT, ACT, GED, and SSAT instruction and preparation to thousands of students. In 2008, he was chosen as an English and Mathematics Expert for ExpertVillage.com.